Barry Maden, a man from Nashua, New Hampshire, has credited the Apple Watch 4 for helping save his life. This is because his Apple Watch Series 4 detected his atrial fibrillation, an irregular heartbeat complication known as AFib. Maden decided to buy the Apple Watch 4 because of the fall detection feature built into the device. Maden’s wife Tara said that he decided to buy the Apple Watch 4 because of its fall detection feature. This is because Maden had experienced a brain injury in the past. And the Apple Watch makes it easy to call emergency services in case he fell. At one point, Maden believed that he was experiencing some anxiety over the holidays. But Maden received a surprise when the Apple Watch showed him a notification about his heartbeat. So he contacted his doctor, according to WMUR. While at a hospital ER, Maden received electrocardiogram — which confirmed the health issue. And Maden’s doctors restarted his heart while he was under sedation. The Watch Series 4 is the first variant of Apple’s wearable device to have a built-in ECG feature. 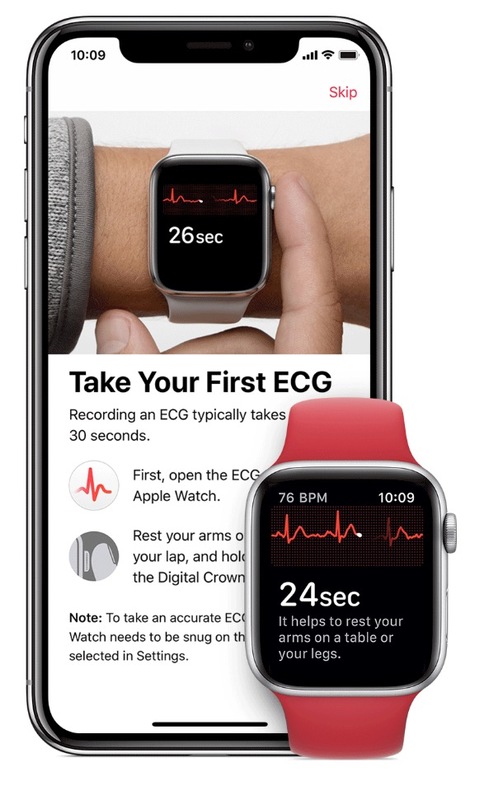 To take an ECG on the Apple Watch, there is an ECG app that records an electrocardiogram — which represents the pulses that make your heart beat. The Apple Watch Series 4 uses the ECG app to check these pulses to get your heart rate and see if the upper and lower chambers of your heart are in rhythm. If they are not in rhythm, then the Apple Watch Series 4 suspects that it could be AFib. If you have an Apple Watch Series 4, then you can set up the ECG app by opening the Health app and following the onscreen steps. Otherwise go to Health Data > Heart > Electrocardiogram (ECG). After it is set up, then you can take an ECG by resting your arms on a table or in your lap and holding your finger down on the Digital Crown and waiting 30 seconds.